Reclaim the natural malleability of your voice so that the emotional and spiritual bounty of your inner landscape, borne on your words, can sing itself into the hearts and souls of all who listen. …something about choosing to say or sing my story in different ways made it a story of beauty. You know it’s not something that needs to be stuffed under a carpet… It’s this life’s story, and it can be celebrated. It’s a victory story, and one that helped me to see the victory. Of my life. Since LifeSong I’ve been living very differently. Remarkably differently! Change of life — transformation – we find over and over again in the experiences of LifeSong. The changes differ in degree and in kind, but show themselves in the context of healing — changed perception, integration, restored confidence, augmented skill, renewed energy, creativity, joy. It’s not just that music is Barclay McMillan’s passion; it’s turning people on to music and to the transformative power and beauty of their own vocal sound that moves him. 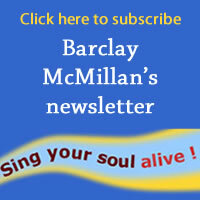 Barclay is like a man striking a great gong: out go the ripples of sound and the world reverberates in response. Barclay understands the importance of vibration. A lot of people have vibrated with him already. Besides the many who tuned in during his days as host of CBC’s national Mostly Music, or locally on Regional Contact, many hundreds of folks in Ottawa, Toronto and other centres have taken Barclay’s one-day workshop Dance on Winds of Sound, a joyous romp through sound to the very satisfying discovery that yes, each of us does indeed have a natural voice and that it is ever so possible to raise that voice in song.